Jenni started Peaceful Paws because, she is a high maintenance pet mom, and understands how other pet parents feel when they cannot be with their pets. It is not easy to trust just anyone with our pets or in our homes. As a dog and puppy trainer, Jenni realized that most behavior issues are energy/boredom related. She wanted to provide an outlet for dogs all over her community to give them an opportunity to be a PEACEFUL, happy, exercised dog! She loves pets of all types and enjoys making them feel comforted and tended to while their parents are away. 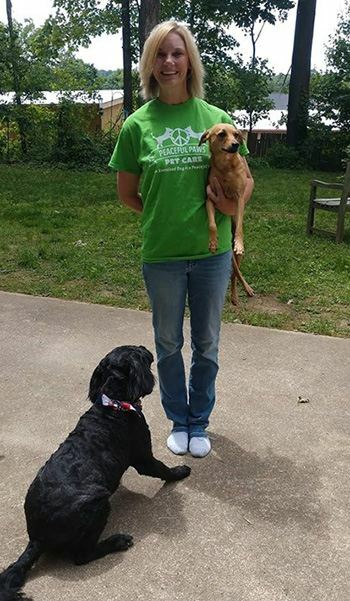 Jenni received her BS degree in Early Childhood and Elementary Education in KY but upon moving to MA in 1997 decided she wanted to focus her time and energy on dog training using Peaceful solutions! Jenni is owned by her 2 dogs and a “clicker trained” fish named Jerry. She loves to camp, hike and listen to music. Jenni Coes practices only “Force Free” methods of dog training. She uses only positive, Peaceful, force free methods of dog training. She is able to solve a variety of behavioral issues. She holds certifications as a Puppy Specialist and Canine Behaviorist. Jenni is the president of her 501c3 non-profit Peaceful Paws Pet Therapy, Inc. She actively visits children in local hospitals with her dogs and other Therapy Pet Handlers. Jenni is a certified evaluator for the AKC Canine Good Citizen programs. She teaches Canine Good Citizen classes, STAR puppy classes, Community Canine Good Citizen and AKC Trick classes at Bow Chika Wow Town in Warwick, RI. (see events section for class dates) Most recently, Jenni has been designated as the Massachusetts Team Leader for Bailing Out Benji, a non profit devoted to eradicating puppy mills. Jenni organizes monthly events to raise awareness in her community about the horrors of the pet store puppy mill connection. Jenni Coes has over 20 years of experience training dogs of all breeds, ages and temperaments. She has been dog obsessed for life. Jenni’s motto is “An exercised dog is a Peaceful dog” and she believes many behavioral issues are directly related to lack of exercise in dogs. Jenni loves all types of animals! Peaceful Paws Pet Care provides daily dog walks or hikes, doggy playgroups, pet sitting in your home for all types of pets, and of course Peaceful methods dog training. Hi my name is Krista. I’m a stay at home mom and part time substitute teacher who has a deep love for animals. I have a current license for CPR and first aid. I’m a caring and responsible person who will treat your pets as if they were my own. I enjoy the outdoors and going for walks. I am currently going for my associates degree at Fisher College and I am also EEC certified. I look forward to meeting and having fun with your pets! Hello! My name is Amber. I am a huge dog lover! I have life experience working with dogs and have worked at a doggie daycare. I work two jobs and in my spare time, I enjoy hanging out with my boxer puppy. I love taking him out on hikes/adventures. If I am not with my pup, I am with your pups! I love what I do and am privileged to work with your fur babies and provide them with luvins and exercise. What is better than wet noses and sloppy kisses? Nothing! I look forward to continuing a career that I enjoy and making more furry friends! 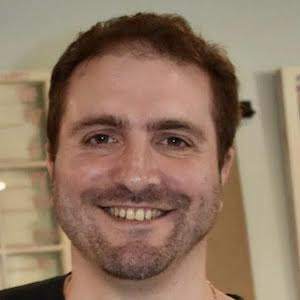 Hi, my name is Adam, and I joined the Peaceful Paws Pet Care team to continue in my pursuit to help, love, play with, and care for animals in a manner befitting your trust. Since I was a child, my family has always had animals in the house. From cats to dogs, there were always little critters around to pet and have fun with. Over the years as a professional writer, I’ve had the unofficial job of owning animals along the way, and it has brought me happiness to give them the love and support they need. I’ll provide the same for yours.